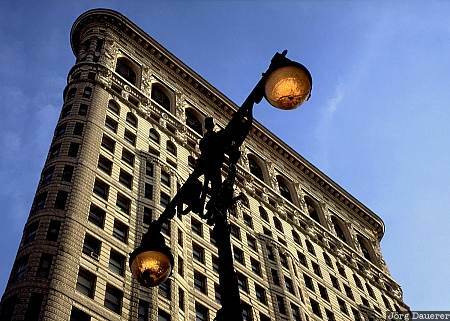 The unique Flatiron Building with a street lamp in the foreground below a blue sky in downtown Manhattan. Manhattan is in New York City, New York in the east of the United States. This photo was taken on a sunny day in October of 1996. This photo is part of the exhibition Street Lamps (July 2008).